Cotton terry is one of the most popular and widely used materials for mattress protection, as it's soft, durable and breathable. 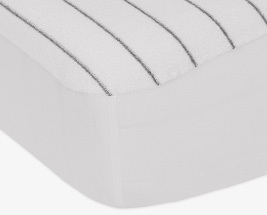 All of our cotton terry protectors are soft and comfortable, with additional features such as permanent anti-bacterial properties, anti-allergy, anti-bed bug, flame retardancy and more. Not sure which protector is best for you? Check out our buyers guide here. Bulk Saving Avalible Email me when back in stock.